Fedde Le Grand is back with the incredible remix of Mary Lambert’s ‘Secrets’, coming via Capitol Records. From its world premiere on Danny Howard’s BBC Radio 1 Dance Anthems show just a weeks days ago, the track has sparked high excitement and was premiered exclusively today instantly entering the HypeM. Now available to stream online, this remix is sure to be yet another success story for the Dutch hit machine as he continues to expand his ever-growing catalogue of club classics. Be sure to click here to listen to Fedde’s ‘Secrets’ remix now! With Mary’s original already boasting a set of wonderfully infectious sing along vocals, Fedde exploits them to the enth degree with his bouncy, feel good, dance floor production that will have crowds everywhere going crazy. Built around a simple but innovative synth hook that continues to develop, rising in pitch throughout, the track offers an exciting and energetic take on the original that both Fedde and Mary fans are sure to love. Alongside this incredible remix, Fedde will also be dropping the official video for ‘Secrets’. A must see for all FLG fans this video features exclusive and never seen before footage from his SW4 show this summer. Click here to watch the amazing new video. Helping Beatport celebrate their 10-year anniversary, Flamingo Recordings recently released their #Beatportdecade Progressive House compilation. Featuring ten massive tracks from the likes of Fedde Le Grand, Nicky Romero, Jewelz & Sparks and many more this compilation showcases the very best Progressive House tracks Flamingo has to offer. Be sure to join in the celebrations and grab your copy now. Continuing to prove why he is still one of the biggest acts in dance music, Fedde Le Grand has performed at some of the worlds biggest festivals this summer including, Ultra Europe, Tomorrowland and EDC. With dates at Electric Zoo and Ultra Japan on the horizon, be sure to catch him at a show near you. 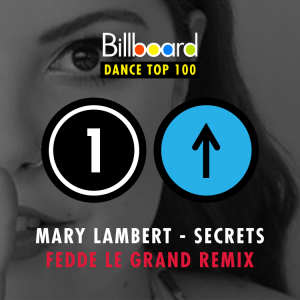 UPDATE: Mary Lambert - Secrets (Fedde Le Grand remix) went number #1 on the Billboard Club Chart!!! Having been in the charts for 10 solid weeks the remixes to Mary Lambert's Secrets have now made their way to the peak position. Check out these super flattering compliments Fedde got on his remix of this Mary Lambert track in particular and his recent remix work in general!! "Fedde's remix was an integral source for the music's achieving of its prominent stature. Le Grand's versions not only captured the attention of his core fans but also aroused interest from deejays who had previously not programmed one of his orchestrations. I have previously been involved with music where Fedde's remixes have been part of the package and they've always served as an asset to that particular melody."